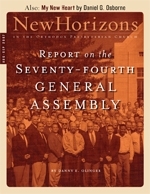 The General Assembly is the highest governing body of the Orthodox Presbyterian Church. Consisting of commissioners (ministers and ruling elders) from the sixteen presbyteries of the OPC, the Assembly represents in one body all the particular churches of the OPC. It must meet at least once a year to deal with matters that concern the entire church. Each Assembly brings the previous year in the church to a conclusion and sets the direction and tone for the upcoming year. I want to thank the many readers of this magazine who have prayed for me during the last two years. The Lord has answered those prayers by giving me a new lease on life. But before we get to that story, let me tell you a little about myself. I was shocked when news came that the Rev. Jerry Falwell had died. He professed and proclaimed Jesus Christ as Savior; he is surely enjoying the bliss of heaven. We should be thankful for the many positive ways that God used him during his life. "... in everything by prayer and supplication, with thanksgiving, let your requests be made known to God" (Phil. 4:6).